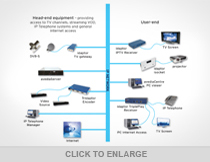 SCCI Alphatrack specialise in providing comprehensive multimedia IPTV system design and installation solutions. The SCCI Alphatrack IPTV system brings networked TV, Radio and AV to both large and small organisations, delivering a high quality multimedia distribution solution that is easy to use. SCCI Alphatrack have installed Exterity IPTV systems to the hospitality market, corporate clientele, the education sector, large scale exhibition and conference centres, call centres and financial dealing room customers. An SCCI Alphatrack IPTV system is capable of broadcasting numerous TV and radio channels either digital terrestrial TV (Freeview) or digital satellite TV (Sky & Freesat) channels to a number of viewing locations throughout a building including desktop PCs, utilising the existing IP structured cabling network. Each viewer can watch a different selected channel. The system is also capable of broadcasting an A/V source such as a camera, information display system, individual pay TV or radio channel from a Freeview, Freesat, or Sky Satellite receiver to a number of viewing locations throughout a building, including desktop PCs. Schools use an IPTV solution to broadcast digital (Freeview) TV, radio, satellite (Sky/Freesat) channels and camera/information system content to desktop PCs in classrooms and large display screens around the school. Corporate offices use an IPTV solution to broadcast digital (Freeview) TV and radio, SKY/Freesat satellite TV channels especially domestic and international news channels over the existing LAN Hospitality: - Hotels use an IPTV solution to broadcast global digital TV, radio, premium entertainment and hotel information channels to bedrooms. Hotels can also welcome guests with tailored messages on prominent screens placed in the hotel reception or public areas.